Superior Data Information System for Large Scale Projects with Exceptional Graphics. Supervisory Control and Data Acquisition SCADA Software. Comes with an hour of free web based training. *Contact sales at 1-888-971-9888 for details. 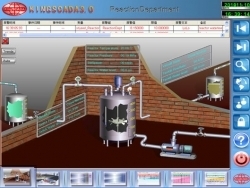 KingSCADA is an Interactive Graphical SCADA System. It is a state of the art SCADA system for monitoring and controlling industrial processes. KINGSCADA software is designed based on customer input and feedback and caters to Automation application needs. KINGSCADA provides reusable components to speed up application development. It is systematic and modular in contrast to the traditional project based types of development platforms. KingSCADA is middle to high-end market-oriented product. It possesses many remarkable characteristics including completed functions, integrated management, modular development, high stability and ease of use, and more. KingSCADA also provides abundant graphical development tools, stunning graphics which can create a facilitated developing environment. This will assist you to visualize the data through the created graphics. With modular architecture exceeding the constraints of region and station scale, and more flexible deployment, KingSCADA will highly enhance the developer’s efficiency and make system maintenance much easier for the operators. This will reduce the cost and ensure the system will run safer and more stable. In addition, this product can create an open data platform and integrate any control system, Remote Terminal System (RTU), database, historical database or other system. KingSCADA can provide a powerful guarantee that you can complete your construction enterprise information system. Development skills are easy to master and the user-friendly interface will shorten the developers’ learning cycle. The use of model development can reduce the workload and shorten the development cycle time and cost, enhancing productivity. Quick completion of fault monitoring and reduction in the cost of the debugging process. High scalability guarantees synchronous updates to stay identical with new technologies and products. High reliability and easy maintenance can save the cost of maintenance dramatically. Widespread 3rd-party interfaces integrate the whole SCADA system into Enterprise Information Management System, e.g. MES、ERP etc., they become the bridge of communication with other different fields. Note: If you use redundant configuration, the configuration of you computer should be higher than the configurations mentioned above. KingSCADA 3.0 is a revolutionary HMI/SCADA product aiming at middle to high end market. It features vivid graphics, highly reusable graphics model and data model, block-based fast data acquisition, real-time intelligent fault diagnosis, undisturbed redundant technology, and powerful web portal publishing that leads to higher productivity, reliability, and scalability. The rich open APIs and convenient web portal support make it easier for enterprises to build integrated intelligent information platform. 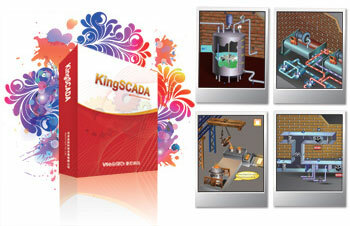 Description KingSCADA 3.0 is a revolutionary HMI/SCADA product aiming at middle to high end market. It features vivid graphics, highly reusable graphics model and data model, block-based fast data acquisition, real-time intelligent fault diagnosis, undisturbed redundant technology, and powerful web portal publishing that leads to higher productivity, reliability, and scalability. The rich open APIs and convenient web portal support make it easier for enterprises to build integrated intelligent information platform. 3. KingSCADA Client Runtime Edition: A KingSCADA client, no drivers, write or read data from KingSCADA Runtime through Ethernet instead of through I/O driver including OPC or DDE. KingSCADA supports WindowXP (SP3), Windows Vista Professional and Ultimate Edition, Windows 7 Professional and Ultimate Edition, Window2003server sp2(or R2). KingSCADA supports multi-language version: English, Simplified Chinese, Traditional Chinese, Japanese, Korean, etc. Driver Driver Support Supports more than 3,500 drivers, include all major brands, like AB, GE, Omron, Siemens, etc. Main Functions 1. User friendly development environment for the engineers, easy-to-learn operations to develop the projects. 2. Supports model based configuration, highly reused data model and graphic model technology. 3. Independent IOServer for data collection, data block concept can help enhance the collection performance. 4.With performance monitoring features to monitor the acquisition cycle for each data block, the user can get the status of data collection, and to customize according to this cycle of adjustment. 5. Supports C based scripting, easy-to-learn, easy-to-use; Provide rich functions used in script; Objects that are set "MemAccess" property to be true are allowed to be used as objects in the script. 6. Supports 3rd-party interfaces such as ODBC, OPC, DDE, ActiveX, API, etc. 7. Supports unlimited Zooming in Development environment and Runtime environment. 8. Supports editing the objects inside of a group or groups. 9. Provides rich graphs to display various values, such as trend curves, report, comparison curves, pie, and cylinder chart, x-y chart, etc. 10. Provides rich genius and graphic models in the library. 11. Supports alarm information record sent by email; Supports alarm area and priority management; Supports store the alarm information in to relational database such as Microsoft Access, SQL Server or Oracle, and display alarm information through Alarm Window. 12. Record history information, qurey the historical data from its own database and display the historical data through trend curves and report. 14. Supports network deployment to deploy single functions on to individual servers, like historical server, alarm server, realtime server, etc. 15. Supports language Switching in Runtime. 16. Supports redundancy solutions, can quickly switch host and standby to ensure the system security, the real-time data synchronization can ensure the data integrity and the caching of data will minimize data loss at the time of crash. 6. Support independent redundancy detect channel, fast switch primary and secondary PC.